Origin and Habitat: Chile (Coquimbo). 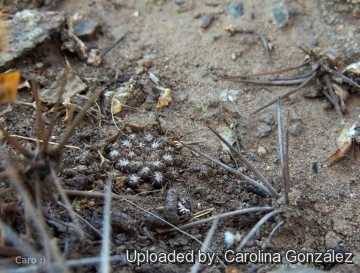 Description: Pyrrhocactus dimorphus Ritter. is a local or morphological form of the widespread and variable Eriosyce heinrichiana. 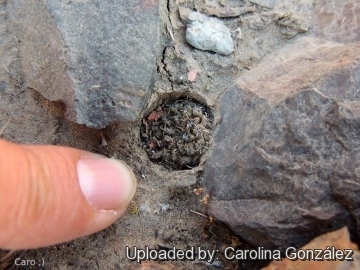 It is a tiny geophytic, cactus rising barely above ground level, usually solitary or sometime branching and slowly growing up to 6 cm in diameter. The specific name "Dimorphus" (= two bodies), refers to the two distinct stem forms, the juvenile form and the adult plant, the two so totally different that be difficult to realise they are one and same plant. 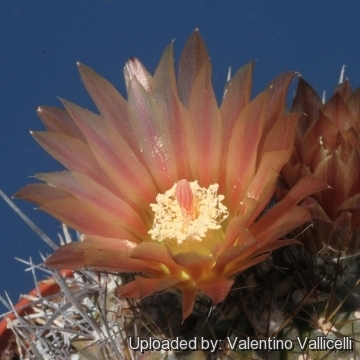 However the distinguishing characteristics of Pyrrhocactus dimorphus, appear to fall within the natural variation of Eriosyce heinrichiana and it should be synonymized with the latter, but it still has a value for a collector because they identify plants with particular characters. Root: It has a tuberous carrot-like root from which arises a contracted neck, ending in an enlarged top-shaped plant body. Stem: Hemispherical to spherical, 2-6 cm diameter, almost black. Ribs: Divided in tubercles , later flattish. Spines: Dimorphous. This species is one of those Eriosyce which pass a short-spined youth stage in which they are already floriferous. Most of the plants after several years develop long spines, giving the plant a completely different fiercely spiny appearance. Spines of juvenile specimens: 6-10, small, inconspicuous, 2-5 mm long, all radial, spreading sideways or flattened close to the plant, from black to nearly white. Spines of mature specimens: Radials 8-12, up to 2 cm long, black to yellowish, the upper radials sometimes longer and bent. Central spines 1-3, black to brown, sometimes light brown to yellow and bent to the side. Flower: Up to 3.5 cm. long, wide funnel-shaped, the underside with white wool and some fine yellow bristles. Petals pale to brownish-yellow, at the edge whiter. Fruits: About 1.5 cm. long, red, hairy. 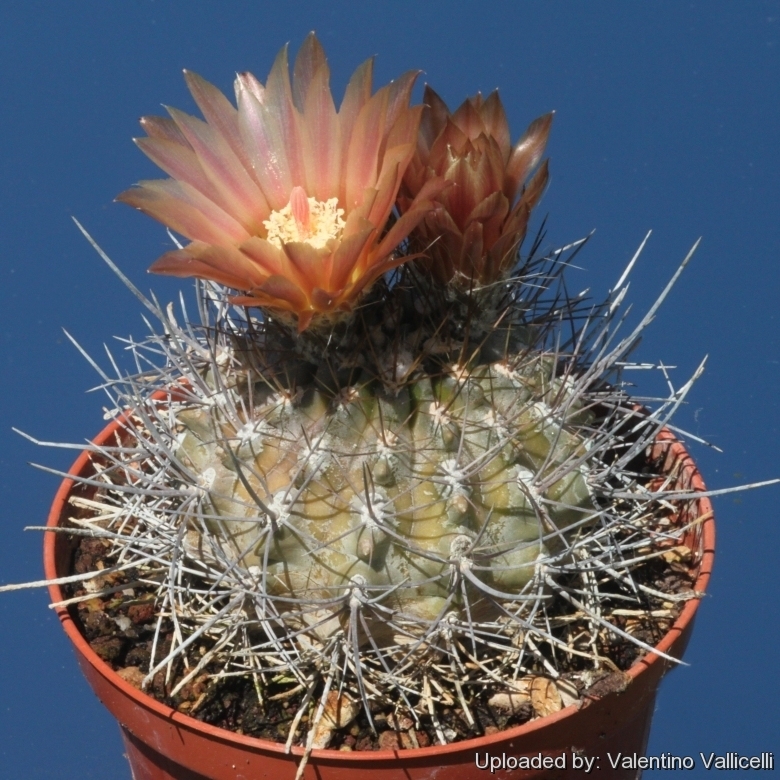 Cultivation and Propagation: Pyrrhocactus dimorphus is a slow growing but relatively easy to grow species, providing they are kept dry during autumn and winter and rot prone if kept in a non ventilated place.